If you are anything like me, then you struggle to find balance between working, being a mom, and trying to stay healthy and fit! It is so hard to find enough time in the day to do it ALL and be everything to everybody! Believe me - I get it!! It truly is a juggling act! One of my best friends, especially this time of the year, is the Crock Pot! It can really make your life easier by allowing you to prepare a healthy meal for your family with minimal effort, even on a day that you have to work late or carry kids to gymnastics and soccer! All you need to do is get organized and have a plan! With a little help, you CAN do it all!! *They don’t require any cooking ahead of time, so they’re very easy and quick to prep. *They cook for the first time out of the freezer and don’t taste like leftovers at all. *You can take advantage of sales at the grocery store and stock your freezer with healthy meals at a fraction of the cost. FAQ: Do frozen meals need to be thawed before cooking? If so, how do you thaw them? I thaw my slow cooker meals by placing them in the refrigerator the night before I’m planning to cook them. They are not always 100% thawed in the morning, but they’re thawed enough to fit in my slow cooker and they always cook perfectly. If you forget to lay them out the night before, You can also thaw meals in a bath of cold water or in the microwave (If you use this method, you will need to transfer the meal from a freezer bag to a microwave-safe dish). FAQ: How long can slow cooker meals be stored in the freezer? They can be stored in a standard fridge/freezer combo for at least three months. FAQ: Do freezer meals actually taste good? You bet. Since they’re frozen without any cooking ahead of time, they cook for the first time out of the freezer. That means they taste like freshly-prepared meals and not like leftovers at all. Yippee! FAQ: How does freezing affect the texture, taste, and nutrition of the meal? Since they’re frozen raw, the texture and taste doesn’t change a bit. According to the USDA Food Safety and Inspection Service, the freezing process does not break down nutrients and the nutritional value should change very little. FAQ: Is it safe to freeze raw meat with veggies? Yes. If you’re nervous about combining raw meat with other ingredients, let me assure you that it’s perfectly safe. (Remember, people cook raw meat and vegetables in their slow cookers and ovens all the time!) According to the USDA Food Safety and Inspection Service, freezing to 0 °F inactivates microbes present in food (like bacteria, yeasts, and molds). FAQ: Can I substitute frozen meat instead of fresh meat? Yes. Go ahead and add the frozen meat right to the plastic bag. Don’t thaw it ahead of time. FAQ: Some of your recipes don’t include a lot of liquid. Should I add broth or water so the meal doesn’t burn? No. Meat and vegetables release quite a bit of liquid while cooking. If you add extra liquid it will dilute the flavor of the dish. FAQ: How does freezing affect the texture, taste, and nutrition of the dish? Since slow cooker freezer meals are frozen without any cooking ahead of time, the texture and taste isn’t changed a bit. They taste exactly the same as freshly-prepared meals. According to the USDA Food Safety and Inspection Service, the freezing process does not break down nutrients and the nutritional value should change very little. Let's go ahead and get down to it! My family LOVES sausage, so I am really excited about this one!! Substituting turkey sausage for regular sausage saves you a TON of calories and fat and makes it 21 Day Fix Approved! You can serve this dish with brown rice or even mashed potatoes. I am going to make some fresh cabbage to go with this also. I love cabbage and sausage together! When I prepared my plate, I just dipped out enough meat to fill my red container. The green container is filled with the peppers, tomatoes, and onions. BONUS: there are no blue or orange containers in this dish!! You may only want to eat 1/2 a green with your meat, but I love onions and peppers (and I used more onions than the recipe called for in mine). I am having this with a yellow container of mashed potatoes and one green container of cabbage. This dish is really full of flavor! We actually had this one last night and I served it with brown rice and broccoli florets! (and rolls for the kids) The dish was a hit with both the hubby and the kids and it is a recipe that I will definitely make again soon! This plate is 1 yellow (rice), 1 red (meat), 1 orange (sauce), 1 green (broccoli). The carrots and peppers in the chicken teriyaki only amounted to about 1/4 green container on my plate.... It will just depend on how you serve your plate. This classic dish is one of my absolute favorites!! Just substitute nonfat yogurt for the sour cream to make it 21 Day Fix Approved! We will be dining on this dish tonight, so I will let you know how it turns out. We have church on Wednesday nights, so it is always a struggle for me to get a healthy meal on the table in such a short amount of time between getting home from work and leaving for church! 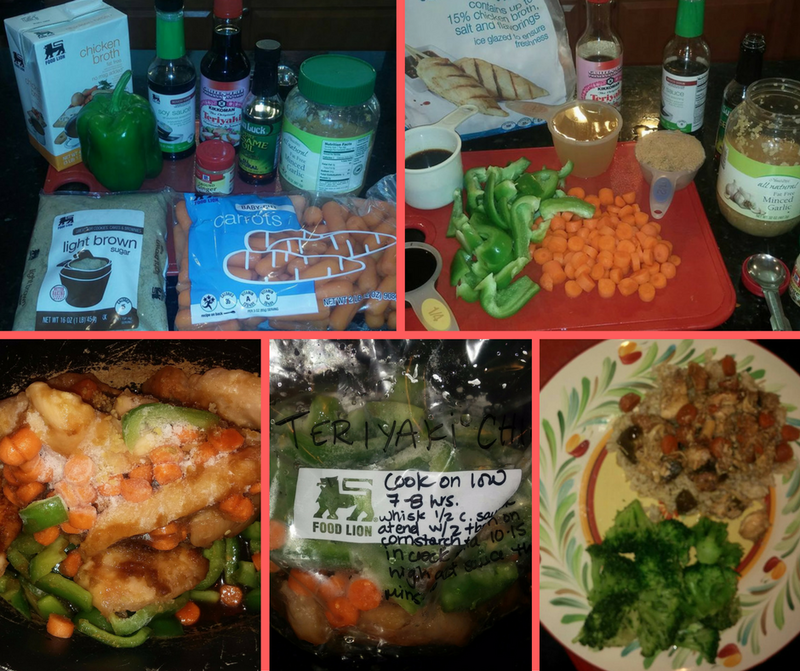 I am so thankful for these freezer crock pot meals - they are truly a life saver! Just a little time spent on the weekend to make busy nights like this a breeze! I served this dish with whole wheat ribbon noodles. This plate contains 1 red (meat), 1/2 green (mushrooms and onions), 1 green (broccoli mix), 1 yellow (noodles). Delish dinner!! I am really excited about this dish. I plan to serve it as tacos with refried beans and rice. My family loves mexican food, so I know that this dish will be a hit! I have included a pic of my ingredients in the comments for you. Enjoy! 1. Label your bags first with cooking directions and date of preparation. 2. If prepping multiple meals at once, cut up and bag all of your meats first, then focus on veggies and sauces. You can even go one step further and wear gloves while handling all the meat. This allows to deal with meat, clean up from handling raw meat, and be done with it! 3. Cooking times may vary depending on size and shape of your crock pot. 4. Serving size for most of the recipes: serves 4-6. You can double the recipes for a large family or to provide more frozen meals for future use as a time- saving trick! *Make two meals at once in the same amount of time! 5. You can cook rice ahead of time while you are prepping these meals and freeze it too. I suggest you store cooked rice in freezer bags separately according to the amount you would use with one meal. For best results with reheating, just place the thawed rice in the skillet with a little olive oil and sprinkle in a tad bit of water and stir fry. This can be a significant time savings for multi-grain rice that often takes 40 mins to cook. 6. Tools needed to start preparing freezer crock pot meals: Just basic kitchen tools, a 4 qt or 6 qt slow cooker, 1 gallon size freezer ziplock bags, and a sharpie. Pretty simple, huh? Yummy!! Who doesn't love a comfort food like meat loaf? I can't wait to try this one! I have actually never made meatloaf in the crock pot before - so this will be interesting! I will let you know how it turns out! And what exactly is the 21 Day Fix? The 21 Day Fix Program is a simple nutrition program that teaches you how to feed your body the RIGHT foods in the RIGHT portions. I used to count calories... now I just count colors! 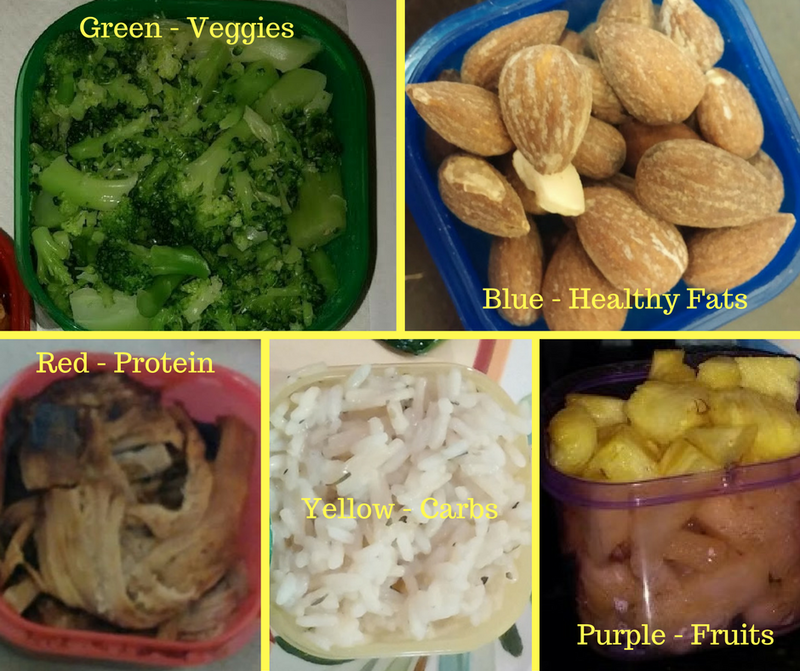 (color coded containers, that is, lol) The color-coded 21 Day Fix containers were created to take the guesswork out of nutrition making portion control simple and easy by giving you the structure that you need to be consistent. Simply put, if it fits in the container and it’s on the approved 21 Day Fix food list, you can eat it! Throw in some simple and effective 30 minute workouts to the mix, and you have absolute GENIUS - a proven program with proven results! Autumn Calabrese definitely knew what she was doing when she created this program! So.........What foods are the RIGHT foods? I have listed just a few foods from each category on the list to give you an idea. There are many, many, many more approved foods! This will just give you an idea of what food groups you need to be incorporating into your diet EVERY day and the containers will give you the right PORTION! Green Container = Vegetables. These can be cooked or raw; lettuces, kale, squash, peppers, mushrooms, onions, green beans, broccoli, cauliflower, carrots, etc. Red Container = Protein. Chicken breast, pork tenderloin, yogurt, eggs, lean ground beef or turkey, or shellfish/fish, cottage cheese, etc. Yellow Container = Carbs/Starches. Ex - rice, beans, sweet potatoes, and whole-grain pasta, etc. Blue Container = Healthy Fats. Mashed avocado, nuts, cheese, and hummus are just a few of the things you can put in this container. Orange Container = Seeds and Dressings. Seeds, olives, coconut, and 21 Day Fix-approved salad dressings, etc. There is also a teaspoon measurement included in the 21 Day Fix program, and this is for oils and nut butters, such as olive oil and peanut butter. First, you will perform a simple calculation to determine your calorie range. This calorie range will determine how many of each container that you get each day. Again, you do not count calories, you count containers. Easy and simple! Autumn Calabrese already calculated and figured everything out for you when she created this program! As convenient and transportable as the containers are, you don’t have to eat out of them. You can measure out the portions in the containers and then empty the container out onto a plate or bowl. The example pictured of the salad is a good example of this concept. **I LOVE this program because it taught me how to fuel my body with the right nutrition in a way that I could consistently stick with to get results! I lost 25 pounds with this program in October of 2015 and have been a Fixer for better than a year now! My desire is to help other people achieve the same thing because I have experienced first hand how simple this program is to put into practice and how well it works if you stick to it! I am here to help! Ask me anything! You can learn more about the 21 Day Fix Program Here. Let me tell you about my other secret weapon that really helps me to eat healthy and be healthy even though I am super busy all the time with mom life and work life! It's Shakeology!! I personally LOVE this product because it is just so healthy for you!! It contains more vitamins and minerals than a typical multivitamin contains. It also has pro and prebiotics, phytonutrients, antioxidants, and adaptogens in it. You could go to the salad bar 10 times and still not get all the good nutrition that this little shake has in it... REALLY! It has made such a difference for me in the overall way that I feel because it truly feeds my body the nutrition that it needs. Additionally, Shakeology really amplifies your weight loss results, boosts your metabolism, and helps rid your body of toxins etc. It really goes great with the 21DF meal plan. It counts as a red (protein) container. Meal planning is key to doing well with the 21DF, so shakeology just makes one of your meals really easy that you don't have to plan or cook for - it's a no brainer! Shakeolology also IMPROVES YOUR HEALTH! It is full of superfood ingredients (acai and goji berries, spirulina, kale, ginseng... just to name a few) that feed the body the nutrition that it craves and it has also been clinically proven to lower blood sugar levels and cholesterol levels. So, while it does promote weight loss, it is so much more than just a protein meal replacement shake! It actually improves your overall health! That is why I still drink it every day even though I have now lost the weight that I wanted to lose... I love the way it makes me feel each day and I know that it is the healthiest meal that I get every day (not to mention that it is fast and convenient and really fits into my busy lifestyle)! You can learn more about Shakeology here. And you can also request a Shakeology sample packet here.